We thank our Lord and Savior Jesus Christ for giving us a church where we can serve and worship His holy and great name; through the prayers and intercessions of St. Mary, the Mother of God, and the defender of the faith, St. Athanasius the Apostolic. St. Mary & St. Athanasius Coptic Orthodox Church (SMSA) began in 2006 with a meeting with His Grace Bishop David in Raritan, NJ. 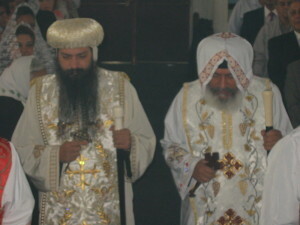 This led to the inaugural liturgy on May 13th, 2006 with their graces Bishop David and Bishop Sherobime of Qina. On October 29th, 2006, the Very Reverend Father Antonious Tanious celebrated his first liturgy at SMSA. Through the prayers and blessings of the saints, God blessed us with a section of property in Hillsborough, NJ that we purchased on January 11th, 2007. Having found a better rental situation, the church moved from Raritan, NJ to Manville, NJ on February 1st, 2009. Fr. Antonious nominated John Rizkalla, who is now Fr. John Rizkalla, to be ordained with him as a support in the expanding services. Fr. 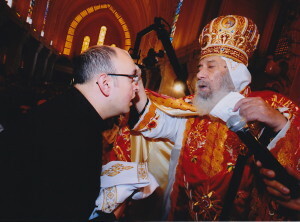 John was ordained June 7th, 2009 , at the hands of His Holiness, the Thrice Blesses, Pope Shenouda III – of blessed memory. As we prepared to submit construction applications to the township, in February 2015, a realtor contacted us about a church being placed on the market to be sold. The Board of Deacons and Construction Committee studied this property and unanimously agreed it would be a better and faster way to achieve a home for the church. On June 5, 2015 we closed on the property and started services there the next day. The following day, we celebrated the first Divine Liturgy being June 7th. © 2019 St. Mary and St. Athanasius Coptic Orthodox Church.